Xiaoming Huo is A. Russell Chandler III Professor at the Stewart School of Industrial & Systems Engineering at Georgia Tech. 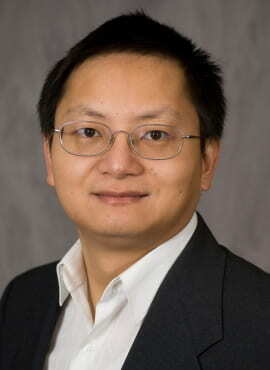 Dr. Huo’s research interests include statistical theory, statistical computing, and issues related to data analytics. He has made numerous contributions on topics such as sparse representation, wavelets, and statistical problems in detectability. His papers appeared in top journals, and some of them are highly cited. He is a senior member of IEEE since May 2004. He was a Fellow of IPAM in September 2004. He won the Georgia Tech Sigma Xi Young Faculty Award in 2005. His work has led to an interview by Emerging Research Fronts in June 2006 in the field of Mathematics — every two months, one paper is selected. Dr. Huo received the B.S. degree in mathematics from the University of Science and Technology, China, in 1993, and the M.S. degree in electrical engineering and the Ph.D. degree in statistics from Stanford University, Stanford, CA, in 1997 and 1999, respectively. Since August 1999, he has been an Assistant/Associate/Full Professor with the School of Industrial and Systems Engineering, Georgia Institute of Technology, Atlanta. He represented China in the 30th International Mathematical Olympiad (IMO), which was held in Braunschweig, Germany, in 1989, and received a golden prize.